[Photo credit to Caroline Y. on Yelp.com] Okay, gray haired uptight old guys in suits keep talking to the other guy while peek at you are hot. I like that. Maybe they should have wood floor so the heels can make louder sound while I walk to consummate my nostalgic fantasy. 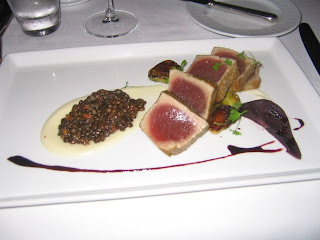 My lasting memory was with the Pacific big eye tuna after couple glasses of champaign and enough foreplay with the oyster, clam, mussel, shrimp, crab and lobster. Definitely get it if you like soft, rich, juicy fish. It's dangerously good there. I'm not talking about the tiny tuna tartar. I mean the real deal, the main dish. Don't you love life. Agh, so good.